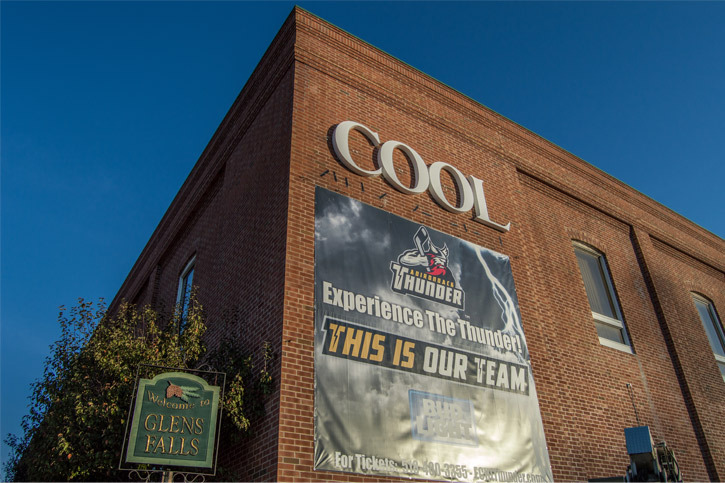 Cool Insuring Arena (formerly the Glens Falls Civic Center), located in downtown Glens Falls, is a multi-purpose sporting and events arena. The arena seats 4,774 and was built in 1979. It also contains a 7,335 square foot banquet facility called Heritage Hall. The arena brings a variety of entertainment to Glens Falls all year long. Originally home to the Adirondack Red Wings, the AHL affiliate of the NHL's Detroit Red Wings, Cool Insuring Arena now hosts the ECHL's Adirondack Thunder. Every winter, high school basketball teams converge on the arena for the NYSFSSAA Federation Tournament of Champions. The arena hosted the NYSPHSAA boys' basketball tournament from 1981-2016. The arena also hosts concerts, ice shows, family-friendly performances, fundraisers, and a wide variety of other events. Enjoy indoor walking all year! Cool Insuring Arena allows walkers to purchase a walking wristband to use the track at the top of the arena. It's only $10 for the public ($9 for senior citizens ages 65+) for the whole calendar year. Cool Insuring Arena is typically open for walking from 7:00 a.m. to 5:00 p.m. Monday through Friday. Be sure to check the official schedule to learn about modified hours, special dates when walking is not offered, and the rules and regulations associated with walking at the arena. The arena also has public skating! From 2:00 p.m. to 4:00 p.m. on most Thursdays throughout the winter, the rink is open to the public for ice skating. The cost is $5 per person. Check the schedule or call the arena at (518) 798-0366 to confirm in advance.